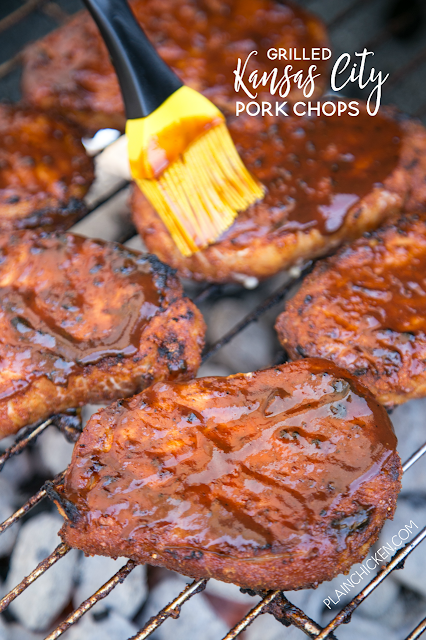 Grilled Kansas City Pork Chops - THE BEST pork chops! Season pork chops with an easy dry rub and refrigerate until ready to grill. 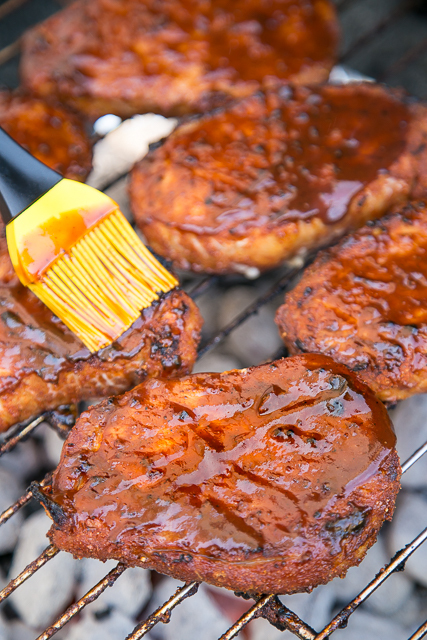 Brush with your favorite BBQ sauce before removing from grill! Pork chops, brown sugar, paprika, garlic powder, onion powder, chili powder, salt and pepper. We make these pork chops at least once a month. 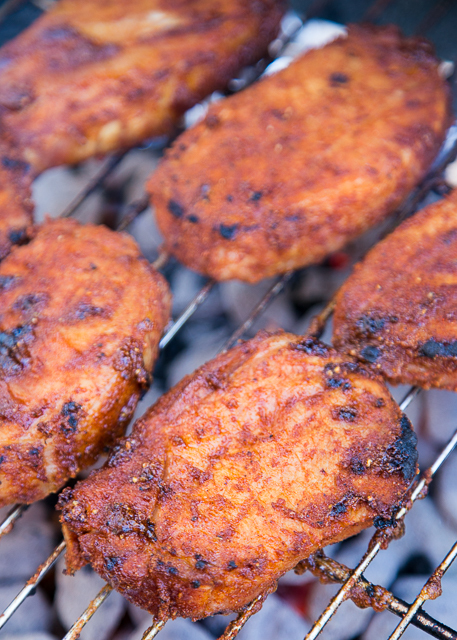 We LOVE this easy grilling recipe. We don't grill a lot of pork chops at our house. I'm really not sure why. Whenever we make them, we both really enjoy them. Pork chops were on sale at the grocery store last week, so I decided it was time to fire up the grill for some chops! The pork chops are marinated in a dry rub and then brushed with some BBQ sauce right before we pulled them off the grill. I let the pork chops marinate all day. I am of the opinion the longer the better! These pork chops were seriously delicious! Nice and tender and full of great flavor!!! I made some extra pork chops and we ate them for lunch the next day. Just as delicious as the day before. Serve the pork chops with your favorite sides - we like Mac & Cheese and Baked Beans. Make sure to use your favorite BBQ sauce to finish off the chops. I used Sweet Baby Ray's because that is what I had in the refrigerator. I also like some of the local BBQ sauces that the grocery store carries - Williams Bros. is one of my favorites! It isn't as thick as Sweet Baby Ray's and has a great flavor. Mix together brown sugar, paprika, garlic powder, chili powder, onion powder, salt and pepper. Place pork chops in a ziplock bag. Add brown sugar mixture. Seal bag and shake to coat pork chops. Refrigerate 2 hours to overnight. Remove pork chops from bag and grill until done, 4 to 5 minutes per side. Brush pork chops with BBQ sauce on each side before removing from grill. Chops look delicious and the brine sounds just right. Woohoo!! SO glad they were a hit! I made these and used the Williams Brothers BBQ sauce. Fantastic!!! Thank You, I also have a new favorite BBQ sauce. Excellant marinade, Stephanie. I made these last night, March 23, 2019 and they turned out great. I ran just short of the paprika and topped it off with a 1/2 TBSP of smoked paprika. What a wonderful happen chance. I didn't use any BBQ sauce because I wanted to taste the chops as is and they were fantastic. While savouring the chops I couldn't help but think that these would taste out to this world if they were smoked as the dry brine would fit in perfectly.